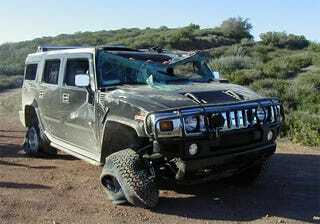 Initially, GM was planning a next generation Hummer H2 model built on the GMT-900 chassis for sometime in 2010. Internally, it was referred to as "GMT915." It was the next-gen chassis for the vehicle that GM has now decided to do away with. The plans now call for the H2 to remain on the GMT-800 chassis, with significant refresh coming sometime between the latter half of 2010 and the first half of 2011. At this point, the H2 will be allowed to run its course and then die. That would put the H2 ending sometime around 2014. So while the H2 is still going away eventually, our first story was off by a couple of years. We apologize. Serves you right for listening to a blog on "news" stuff anyway. Fercrissakes, we have a feature here called "Hoon of the Day."